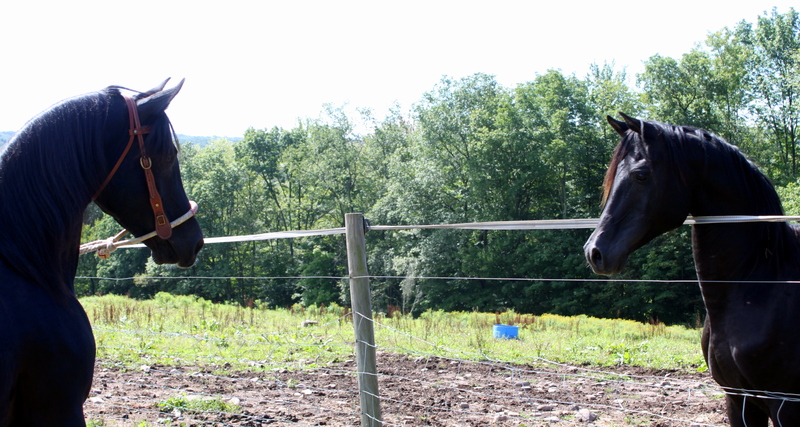 My two black stallion...Looks almost like a mirror image! ***Please Note**** We have made some changes to our breeding policy. ALL mares are required to stay a minimum of 45 days so they can safely be checked in foal in order to maintain the Live Foal guarantee. We recommend leaving your mare for a sufficient amount of time that she can either be confirmed in foal by a veterinarian or she passes her normal heat cycle following breeding without showing to the stallion. Please make sure your mare is healthy and breeding sound before bringing her for breeding to alleviate any disappointment in an open mare once you return home as we want your breeding experience to be a good one. Want color? Check. Want disposition? Check. How about SMOOTH gaited bliss under saddle? Yup, got that too! How about PRETTY? Yup got that covered too! Welcome to the world of the Missouri Foxtrotter! The best kept secret of the Ozarks has arrived in the Catskills...and we don't plan on keeping quiet! If you meet one, you'll want to ride one...and if you ride one you'll want to own one...or two...or three!! 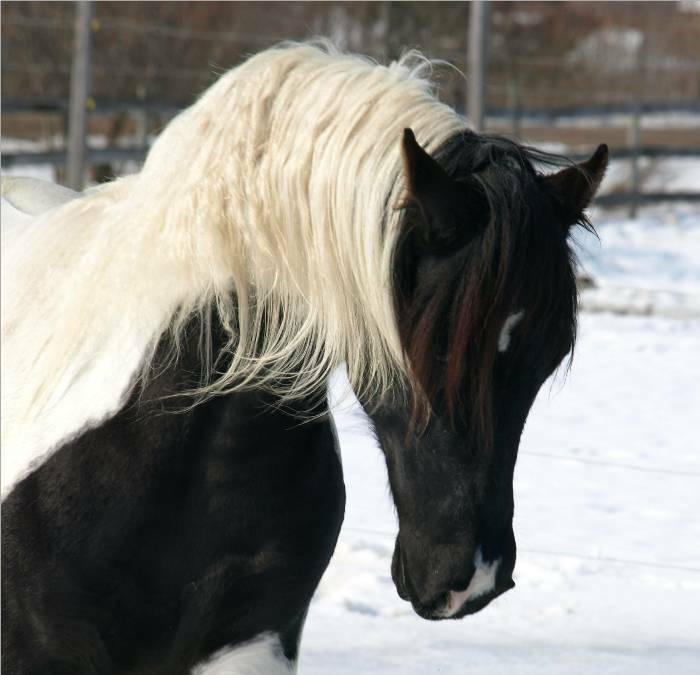 This gorgeous stallion is a proven sire of foals that look just like him and grow up to be valued and well loved members of the Equine community. This year we are expecting six gorgeous babies from this magnificent stallion...most will be available for purchase so check back often. Renegade will be available to approved mares, live cover only. His foals will be registerable as Missouri Foxtrotters, Spotted Saddle Horses and Pinto. 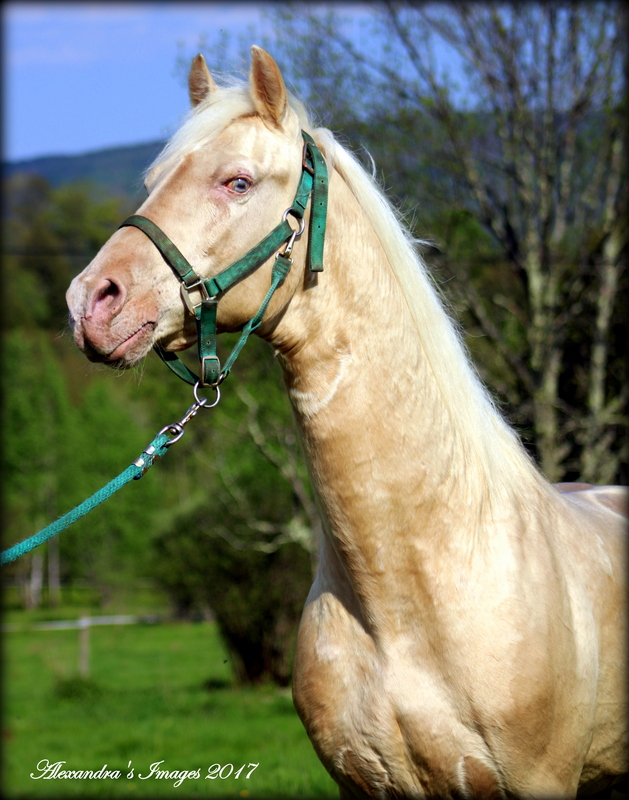 Can also be bred to Arabians for double registered Pinto Half Arabs! Click his photo to go to his Page for more information. Although Joe, as well as Renegade is a guaranteed color producer, that isn't why I chose him for my breeding program. Bred by the great Lee Yates, Joe has all the qualities that the breed is known for. He has excellent conformation, a quiet disposition, lots of "pretty", solid gait and has proven to pass these on to his numerous offspring. Joe has a V Factor of 64 and is line bred to the one and only Golden Governor. He has no Missouri Traveler or any of the other popular lines of recent times which makes him an outstanding cross for our mares. I hope to breed a stallion quality colt to keep for the next phase of my breeding program. Joe is 25 this year so to be able to preserve his legacy is a goal worth striving for! Stallion Prospects- This is where we list our future prospects for the stallion roster. Check back to watch them grow and see if they make it! We offer a live foal guarantee on all of our stallions. This means that your foal must stand and nurse. Special circumstances will be considered at our discretion. We sincerely want your foaling experience to be a good one. We offer some other special guarantees for some of the stallions. Special discounts for Class A (or better) Champion mares or producers of Champion foals. These guarantees do not include mare care or costs associated with artificial insemination. Mare care will be $5.00 a day dry/ $7.00 a day with foal. SPECIAL INCENTIVES: If you book your mare to any of our stallions by January 1st of the current breeding year, mare care is free for the first 7 days ! We also offer multiple mare discounts. Mares do not need to be bred to the same stallion as discounts will be figured as percentages not dollar amounts. Returning mares will be given a 10% discount. We reserve the right to approve all mares being bred to our stallions. Mares must have a negative coggins (within six months), culture, and a certificate of health dated within 30 days. No exceptions. Contact us for updates on our health requirements. Please contact us via email at vhfarab@yahoo.com or phone 845-798-0083 with any comments or questions.